Large (7-10) - $5.99 X-Large (11-13) - $5.99 Only 3 left! Once upon a time there was a honeybee she loved pollinating bight flowers, and talking to humming birds. One day she made a friend with a little boy humming bird who told her because of the buzzing of her wings she must be a bird not a bee. She believed him for a day, following him around from flower to flower. But, it was really hard for her to keep up, and in the distance, she heard her family buzzing for her. She said goodbye to her new friend, then flew back to the hive where she felt at home. Your child can be just like that little bee in the Kids Black and Yellow Striped Tights. 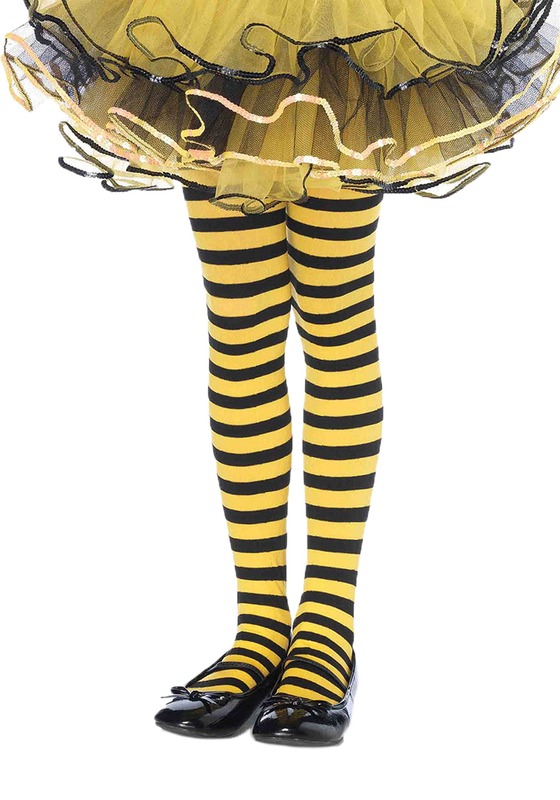 The yellow and blacked stripped tights are a polyester/nylon blend of fabric. The elastic waistband should make being a bee more comfortable while flying around and making honey.